President David Granger and Minister of State Joseph Harmon. Minister of State Joseph Harmon, whose gazetted portfolio now includes oil and gas after that responsibility was shifted to the Ministry of the Presidency, is not required to meet with representatives of oil companies, multiple officials confirmed. “The Minister of State in the Ministry of the Presidency is responsible only for such matters as I delegate to him with respect to reports to the National Assembly and public sector and stakeholder engagements,” President David Granger told executives of a number of oil companies in correspondence in early October. “Foreign and local agencies, corporations and financial institutions are urged to refer all oil and gas matters to the Department of Energy, Ministry of the Presidency,” the President added in his letter. 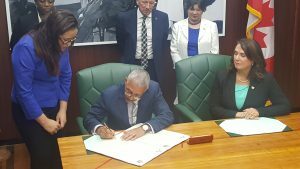 President Granger is also on public record as saying he is in charge of the oil sector and the Ministry of the Presidency’s Department of Energy would evolve into a ministry in another two years. Harmon’s responsibilities were publicly confirmed on Wednesday by Minister of Foreign Affairs and 2nd Vice President, Carl Greenidge. “Minister Harmon, as far as I’m aware has no responsibility for investment. The investment is responsibility of business deals with some investment. Foreign Affairs deals with some investment then you have the sectors which have responsibilities”. For Greenidge’s part, he said the Foreign Ministry, with responsibility for for trade,” “explains policy” and speaks with investors in the petroleum sector. Notably, it was Business Minister, Dominic Gaskin who signed an agreement of collaboration with the Minister of Natural Resources of the Canadian Province of Newfoundland and Labrador, Siobhan Coady. Gaskin also spoke at a reception that evening at the Canadian High Commissioner’s residence. The recently appointed Head of the Department of Energy, Dr. Mark Bynoe was also present at both events. Increasingly, Dr. Bynoe has been stating government’s positions on the hydrocarbon sector at public speaking engagements. Before the portfolio was shifted from Minister of Natural Resources Raphael Trotman to Harmon and even after then, he had met with top oil company representatives, negotiated the 2016 agreement with ExxonMobil and reported to the parliamentary committee on Natural Resources. Following the appointment of Dr. Bynoe as Head of the Ministry of the Presidency’s Department of Energy, the Guyanese leader in early October, 2018 informed top oil companies that, according to the Petroleum Act, he is the Minister of Petroleum. “The establishment of the Department means that, as President, I now have responsibility for petroleum pursuant to the Petroleum Act. 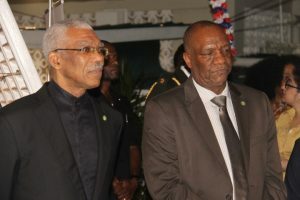 I am directly and solely responsible for approving exploration and production licences, work plans and local content plans; decommissioning and monitoring and adjudicating, where appropriate, compliance with the laws and regulations, inter alia, of the Cooperative Republic of Guyana,” Granger said in a letter seen by Demerara Waves Online News. In the August 2, 2018 Official Gazette, a notice that was published concerning ministries and assignment of responsibilities and the creation of the Department of Energy under the Ministry of the Presidency, Minister Harmon is responsible for petroleum (oil and gas) matters and the Department of Energy Petroleum (Oil and Gas) at the Ministry of the Presidency. Then President Donald Ramotar had delegated that responsibility to then Minister of Natural Resources, Robert Persaud, a portfolio that Trotman had inherited when the People’s Progressive Party Civic was voted out of office in the May, 2015 general elections.